A new year has arrived, the holidays are over and it is time for me to get back in shape! Happy New Year Friends! As sad as I am to see the holidays end, I do enjoy the new beginnings of another year. A fresh start to life and the anticipation of the upcoming year has me a bit giddy. But what doesn’t have me giddy is the extra weight I gained over the holidays! If I had it to do over, I would still enjoy champagne, have that extra bite of dessert and go out to nice dinners with family and friends because those times are precious and irreplaceable. A few extra pounds? No I’m not happy about it but I know I can do something about it. Can you imagine life if – when we gained weight, we could never lose it again…like ever? WOW, what would the world be like? But we can so let’s get cracking and shed those extra pounds! Who’s with me? You have heard me talk about the KETO diet for some time now, a diet regime I have been on and off over several years. I like that it works quickly and I can lose weight at a rapid rate but don’t like that I can also gain it back fairly quickly too. And of course there are many side effects, kidney stones are a real possibility. I ended up in the ER not knowing what that intense pain was, that was an eye opener into the dangers of some of these fad diets. Another danger of the KETO diet is dehydration, the body loses so much water very quickly, dehydration is a real risk for many people. The “KETO FLU” is another risk – many people experience flu like symptoms such as headaches and fatigue from the lack of sugar and carbs, drinking plenty of water is very important. It is also crucial to monitor the fat levels you are consuming, since KETO requires a high fat intake, you must be aware of the “good fats” and “bad fats” you are ingesting, an increase in bad fats can cause serious problems in the long run. If done correctly and carefully, KETO can be beneficial in losing weight, lowering blood pressure, cholesterol levels and controlling blood sugar. I have written several posts about KETO and shared many recipes, here are a few. Check out my site for many others. Today, I am sharing another breakfast recipe. When it comes to low carb breakfast options, eggs gives us the most variety in recipes. And it’s hard to pass up a 3 egg omelette with oozing mozzarella and a bit of spinach to make it feel healthy. This recipe is hard to resist, give it a try. Slice onion and saute in butter until caramelized. Add the spring onion and cook until tender. I didn’t have any spring onions on hand, so I omitted them from the dish. Add spinach to the pan and cook until wilted. Remove vegetables from the pan. Mix 3 large eggs, cream, salt and pepper together in a bowl. Pour the egg mixture into the pan and allow to cook over medium-low heat. Once edges of omelette begin to set, spoon spinach and onion over 1/2 of the omelette. Crumble mozzarella or goat cheese over the spinach. 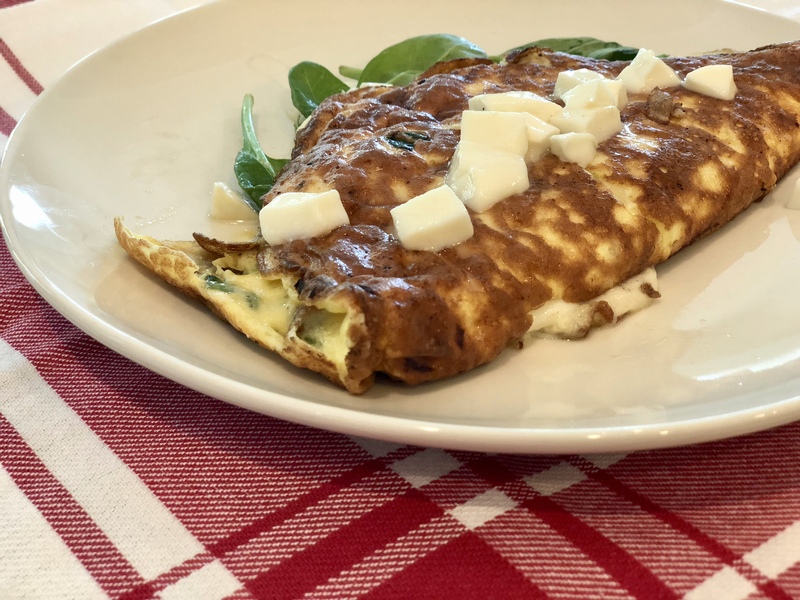 As the top of the omelette begins to set, fold the omelette and serve with more cheese on top! Enjoy your 3 egg breakfast with salsa or a cup of Joe. Are you on a low carb diet? Any favorite recipes you care to share? Hi! Yes it is and great for dieting. I am going to have one for dinner today 😉 Hope you’re doing well! You should! A healthy and energetic start to the new year! And healthy too! Enjoy and thanks for visiting.